Birmingham – A Terrorist Target in October 2010! 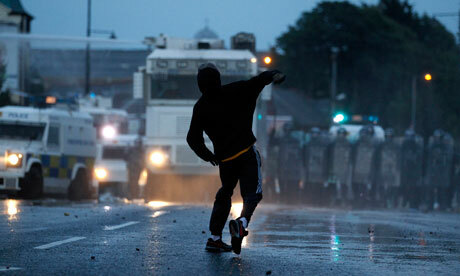 A nationalist protester throws a missile at police in the Ardoyne area of north Belfast in July. Photograph: Cathal McNaughton/ReutersIrish republican dissident groups are targeting the Conservative party conference this autumn, raising fears of a repeat of the 1984 Brighton attack that nearly killed the then prime minister, Margaret Thatcher. Sources in Northern Ireland said that the October conference in central Birmingham had emerged as the prize target on a hit list drawn up by resurgent republican paramilitaries. Patrick Mercer, ex-chairman of the Commons subcommittee on counter-terrorism, said former senior police and army intelligence officers had informed him that dissident splinter groups had discussed targeting David Cameron’s first conference as prime minister. He said: “They want to kill by the end of August in order to get themselves poised for whatever operations they can mount in September leading up to the Tory party conference in early October. There are doubts over whether they have the capability, but the aspiration is certainly there and West Midlands police would be crazy not to take the threat seriously.” The West Midlands force confirmed it was aware of increased activity by dissident republicans and said its counter-terrorism unit was constantly assessing the threat ahead of the Conservative party conference. Robertson said his committee would question Paterson about the threat level and co-ordination between police and the intelligence services when it met on 8 September. Security for the Tory conference is likely to be raised. Mercer, whose army career included nine tours in Northern Ireland, said his police and army contacts had strong intelligence on republican dissident activity and he was sceptical whether the groups would be able to mount a spectacular mainland strike. Police have already briefed businesses in the vicinity of the conference, to be held in the city’s Hyatt Regency hotel from 3 to 6 September. It will be the first held while the Tories were in government since 1996. The Provisional IRA came close to killing several cabinet ministers when they bombed the Grand Hotel in Brighton in October 1984. The blast devastated the Conservative party conference venue killing five people, including Conservative MP Sir Anthony Berry. The PIRA last bombed mainland Britain in 1996, targeting the London Docklands and later devastating Manchester city centre. Experts believe that veteran bomb-makers from the Provisional IRA are helping splinter groups to carry out the recent wave of attacks in Northern Ireland. Sources for West Midlands police said they had no intelligence of a specific threat against the Tory party conference. The group has been linked to factions within the Real IRA who planted devices in London at the turn of the millennium, and militants who fired a rocket-propelled grenade at the headquarters of MI6 in 2000. Previous Pakistans Flood will cleanse the nation of Mullahs?